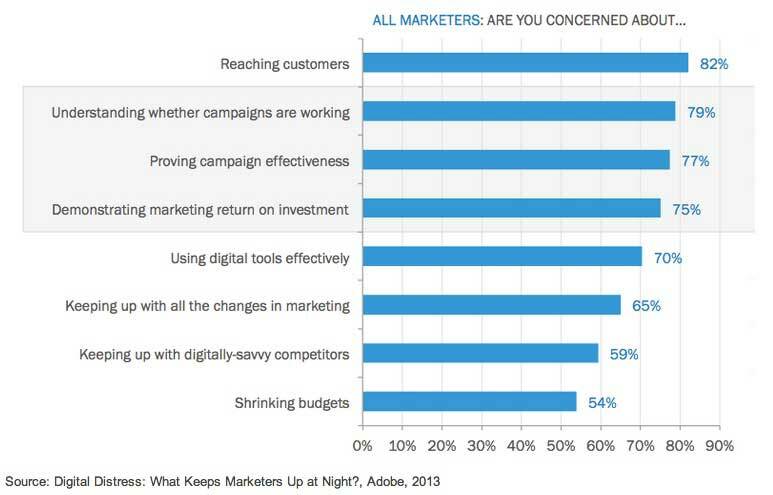 Not surprisingly, the foremost worry for marketers is reaching customers, with 82% saying it is a major concern, according to a recent survey by Adobe. The next most common worries are understanding whether campaigns are working (79% of survey respondents) and proving campaign effectiveness (77%). Demonstrating return on investment for marketing spend is the fourth biggest concern (75% of respondents), followed by using digital tools effectively (70%). Below, additional key findings from the report, Digital Distress: What Keeps Marketers Up at Night?, which was based on data from an online survey of 1,000 US marketers (263 digital marketers and 754 generalists). 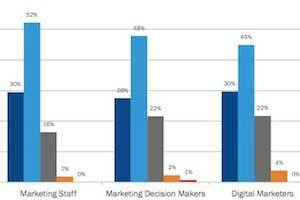 Only 48% of the digital marketers surveyed feel highly proficient in digital marketing. Generalists are even less confident, with just 37% saying that they feel highly proficient. Overall, only one in three marketers think their companies are highly proficient in digital marketing, and only two out of five marketers think their colleagues and peers are highly proficient. In particular, marketers feel ill equipped to tackle the digital challenges of e-commerce, personalization, and measurement. 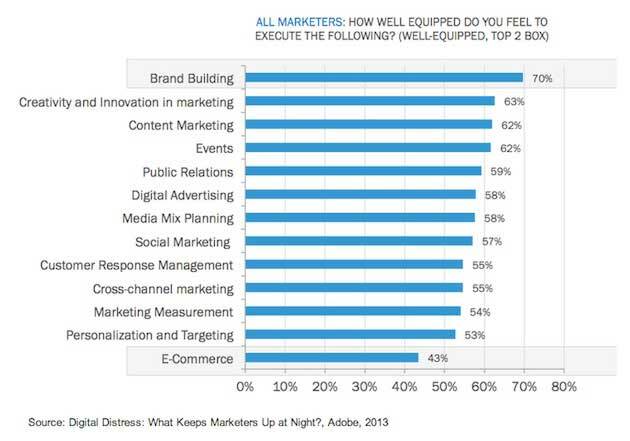 In general, marketers have low confidence in their organization’s marketing performance. Only 40% think their company’s marketing is effective. Just 44% say their marketing departments have a great deal of influence over their organization’s overall business strategy. 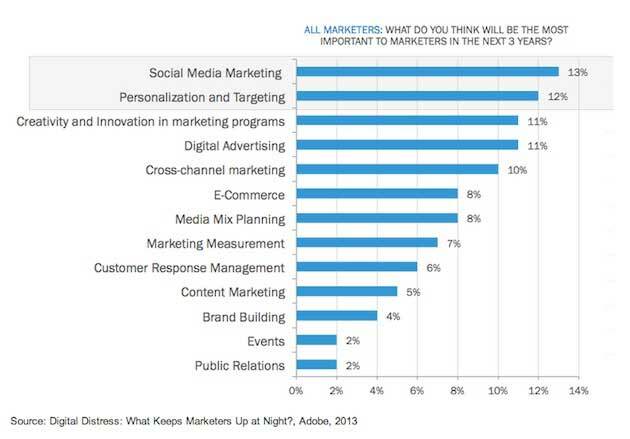 76% of marketers think marketing has changed more in the past two years than the past 50. Marketers are mixed on what areas to focus on in the future—with social media, personalization, digital advertising, and cross-channel marketing all seen as rising in importance over the next three years. 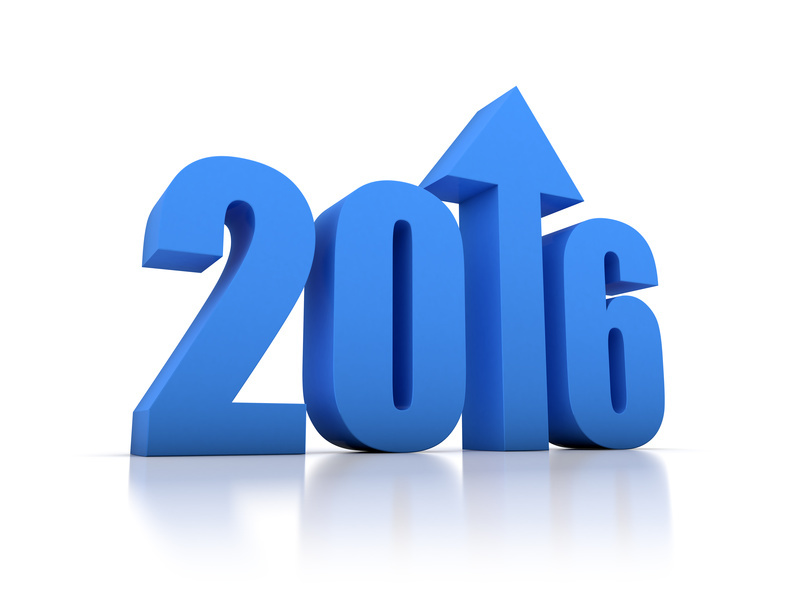 83% of respondents said proving return on investment on marketing spends is important. 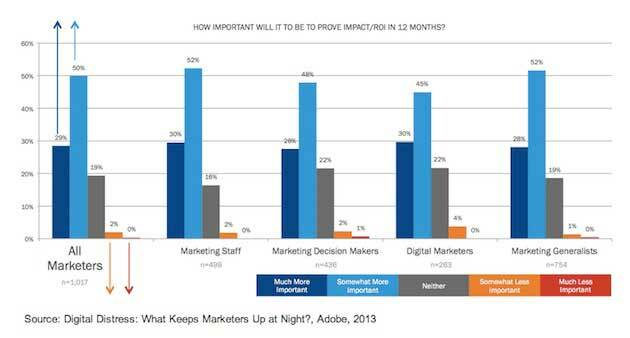 79% say it will be even more important to prove ROI in the next 12 months. About the research: The report was based on data from an online survey of 1,000 US marketers (436 decision makers, 499 staff members; 263 digital marketers, and 754 marketing generalists). The survey was conducted between August 26 and September 11, 2013. Can you precisely define your target market and what motivates them? √ Does 50% of your target audience say they definitely or probably would buy your product?